Our apartment, located on the north wing of Margate Gardens Apartment Complex, is situated on the ground floor. Surrounded by lush tropical gardens and central communal pool. Very quiet, comfortable 2 bedroom, 2 bathroom, air conditioned (bedrooms only) apartment, fully furnished and equipped with all the necessary tools to insure a relaxed and enjoyable stay. 1 Master bedroom with queen size bed, shower and bath tub and auxiliary bedroom with twin beds shower and bath tub. Cable TV and high speed internet service is provided. Maids service is provided every 4 or 5 days a cost of US $ 20.00 per visit. This is the perfect place to feel relaxed and laid back. Very close to all the action but yet it feels that as if you are in a tropical paradise with no worries in the world but to forget about your problems and enjoy the warm peaceful ambiance of Barbados. Gated community, private parking . Great value! Ground floor apartment with porch and communal swimming pool. Lush tropical gardens, quiet and serene yet close to many great restaurants, malls, banks, fast food restaurants, convenience stores, beautiful beaches and the 1.5 KM long South Coast Board Walk with its spectacular views; complete with panoramas seats and retreats. Great place to observe our spectacular sunsets from November to April. 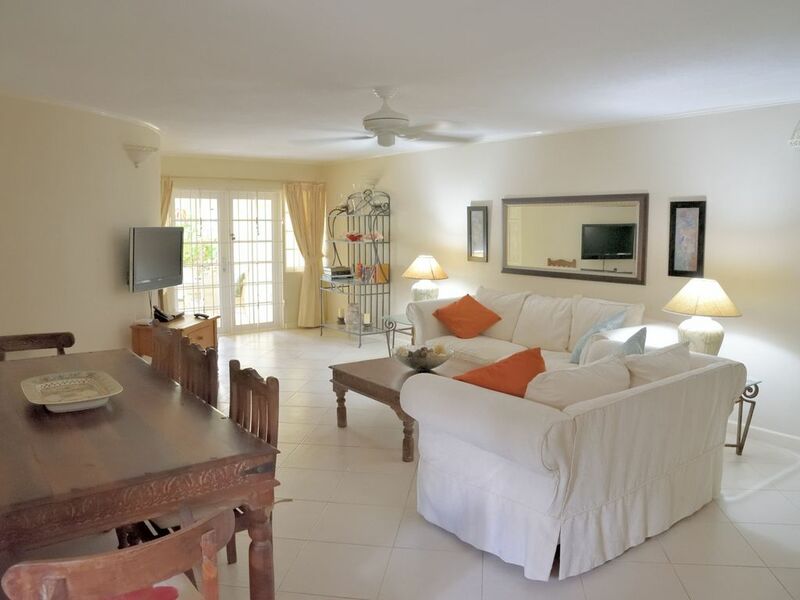 Margate Gardens gated community is perfect for the family with up to 3 children and also for those 2 couples who look to relax and enjoy peace and quiet and yet have all the top entertainment of the island at fingers reach. The unit was very dark, filled with cobwebs and in need of major upgrades. The area is decent, but there is a sewage break just outside the complex. Most days the smell was painful not to mention the bits of toilet paper floating in the street. Great location, lovely safe property, beautiful grounds. It was a lovely 2 weeks at the accommodation. It was well equipped and clean. Good wifi connection. The grounds that the apartment is in were beautiful and the pool was fab! It's literally across the road from the boardwalk/sea and then a couple of minutes walk to the part of beach where you can bathe. There's a shopping complex next to the complex which was very handy, and we loved hastings! Great apartment & great holiday - we hope to return! Excellent tenants. They are welcome anytime on at my property. Just like a home from home. Beautiful apartment lovely grounds. I loved my stay at the apartment during the carnival period, the location was perfect during our stay. Shops and food where next door, so we did not have far to travel. Communication with the owner was easy and straight forward. The property was clean well laid out and most importantly comfortable, the pool was relaxing and pleasant. Im looking forward to our next stay the following year for carnival. I am so glad that you enjoyed your stay at #15 Margate Gardens....we strive to make your stay as comfortable as possible and I really appreciate your review. I would love to have you back for Kadooment next year; so please book ASAP to make sure it is available. We are three female professionals living in New York looking for accommodation while returning home to Barbados for the Crop Over Festivities. The entire process of staying at #15 Margate Gardens was top notch. Once we decided to stay at # 15, we contacted Mr. Marshall who was extremely professional and responsive to our many inquiries. He provided clear instructions and accurate description of the property. Mr. Marshall did everything to ensure we had a wonderful stay including arranging for a driver to collect us at the airport and take us to #15. Upon arrival at the apartment we were promptly greeted by property manager Ava, who warmly greeted us with true Bajan hospitality and provided an overview of everything we needed to know. Comfortingly, she stayed two doors away in the event of any issues, of which there were none. When we entered # 15, we felt as though we had already known the property. It was exactly as depicted in the pictures on the HomeAway site. The apartment was spotlessly clean and fresh. #15 was well appointed with everything you need. Beach and bath towels, iron and ironing board, washer dryer, cutlery and cookware, glasses, plates and small kitchen appliances. There was even a roller way bed available. Ceiling fans and A/C units were available but hardly used as there is a cool breeze the blows through the apartment. The spacious and well laid out apartment was ideally located on the ground floor at the back of the complex so it is very tranquil with easy access to parking and pool areas. The apartment complex is conveniently nestled in the hub of the South Coast activities. It is on the main Hastings Road directly across the street from the Boardwalk and immediately next to Lanterns Mall with many casual dining options, convenience store, boutiques and banking facilities. Also finer dining establishments like Tapas and Naru are across the street. You are literally a stone's throw away from the popular Accra Beach and and in close proximity to St. Lawrence Gap, Historic Garrison Savannah and Carlisle Bay. I had several visitors during my stay and they too were impressed by the property and apartment. The grounds and pool areas of the complex were immaculately maintained. Overall, I highly recommended this well maintained apartment for convenience, value, location, cleanliness, security and for the professionalism of everyone involved. Thank you for allowing us to feel right at home during our stay. This was our first stay at this property and we were absolutely thrilled. The booking process was seamless and easy. The owner provided clear and concise booking information, responded promptly to any questions we had and was very accommodating. Upon our arrival we were met by the person who manages the unit for the owner. She provided all information we required and was available throughout our stay to respond to the few questions we had. The unit itself is beautifully appointed and spotlessly clean. All amenities were as depicted on the Homeaway site. The unit is very well equipped with a washer/dryer, iron, etc. and all dishes and cooking utensils we required. The unit was cleaned during our stay and the cleaning staff's work was impeccable. The wonderful grounds staff maintained the common areas constantly throughout our stay. They paid great attention to detail and kept all areas very clean. The complex itself is absolutely beautiful and the pool area is an oasis. The location is perfect. It is a short walk to the Boardwalk, beautiful beaches and exceptional restaurants. We have travelled to Barbados on numerous occasions and this property was simply the "best of the best". We will return to this property in 2016 and, given our overall experience, would not consider staying at any other location in the future. The entire experience was wonderful and our stay was exceptional. It is just excellent in all aspects! Margate Gardens 2 bedroom ground floor apartment is very conveniently located on the South Coast of Barbados. Across the road from the popular 1.5 kilometre board walk. It is the first Barbados Boardwalk by the sea, complete with panoramas, seats and retreats. All ages and abilities use it. A breathtaking 10 minute stroll to one of the best beaches on the South Coast, Rockley, is only a stone throw away. St. Lawrence Gap, the entertainment centre of Barbados is just 2 km away. Restaurants, malls, bars, convenience stores, fast food restaurants, within walking distance. The historical Garrison is just 1 km away. Should you prefer not to rent a car, public transport is at your finger tips. For the golfers, Rockley 9 hole is 1.5 Km away and the local favourite Barbados Golf Club is 9 km away. Yet, once you are at Margate Gardens, surrounded by lush tropical gardens and central communal pool you feel relaxed and unaware of all that is going on so close. Quiet, serene and well kept. Sunny weather mostly all year round makes Barbados an ideal location for golf and the perfect vacation spot for golfers and 'would-be' golfers! The glorious weather conditions are complemented by world-class golf courses and facilities. Most golf clubs offer professional instruction. Several hotels and resorts offer special golf packages and Barbados is increasingly being regarded as one of the top English speaking islands for a Caribbean golf vacation. Several golf tournaments are hosted throughout the year, attracting participants from a number of countries including Europe and North America. In December 2006 Barbados hosted the World Golf Championships World Cup. The four-day tournament was held at the Sandy Lane Resort on the west coast of the island. In October 2004, perhaps the world's most famous golfer - Tiger Woods - chose Barbados as the venue for his wedding. The ceremony took place at Sandy Lane Golf Course. Mingle with the locals at the Barbados Golf Club, or play at the spectacular Apes Hill Golf and Country Club; one of the most breath taking golf courses in the Caribbean.